Many food bloggers are also photographers – or are learning, or want to be, or at least take photos of their food. We can’t deny it, food is a visual experience (except if you go to Blind Cafe) and it’s best when shared! I’ve had an invested interest in photography since I was young – I have spent time in the dark room and had photography classes in high school and college. I’m no expert, but I love capturing the beauty around me with travel and food, so I keep snapping shots. In the digital world we live in, I was thrilled to learn about Easy Canvas Prints because they take your photography and make photos on canvas. They invited me to try for myself and within five minutes after uploading my image (I had to go with the Grace(full) Plate apple) my image was ready to go and I clicked order. You can see the image above hanging on my wall. The quality is high and I love taking something that I keep digital, into a work of art now in my kitchen. I invite you to not forget to take your beautiful photos (of food) and print them, make them into cards, print them onto canvas or even photographs. You should try Easy Canvas Prints – the experience was easy and I’m very happy with the final product. Finally, it’s perfect timing for a gift! 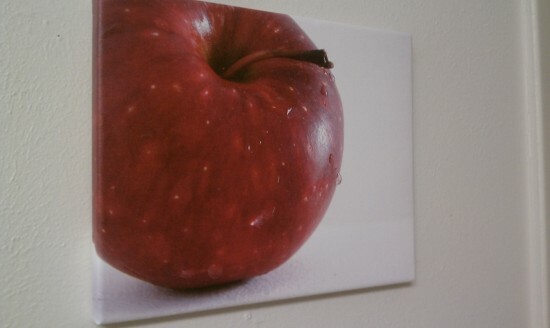 Disclaimer: Easy Canvas Prints provided me with a canvas product to try out for myself and if I chose, to share with you. All opinions, as always, are my own. What can I bring on Sat. ?